Crystallization is an important technique for separation and purification of substances as well as for product design in chemical, pharmaceutical and biotechnological process industries. This ready reference and handbook draws on research work and industrial practice of a large group of experts in the various areas of industrial crystallization processes, capturing the essence of current trends, the markets, design tools and technologies in this key field. Along the way, it outlines trouble free production, provides laboratory controls, analyses case studies and discusses new challenges. 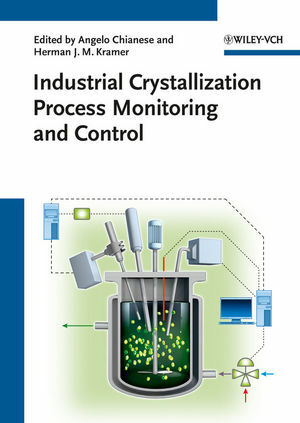 First the instrumentation and techniques used to measure the crystal size distribution, the nucleation and solubility points, and the chemical composition of the solid and liquid phase are outlined. Then the main techniques adopted to control industrial crystallizers, starting from fundamental approaches to the most advanced ones, including the multivariable predictive control are described. An overview of the main crystallizer types is given with details of the main control schemes adopted in industry as well as the more suitable sensors and actuators. Angelo Chianese is full Professor of Chemical Plant Design at the University of Rome La Sapienza. He worked as a process engineer for the first 10 years of his working life, before joining academia. Prof. Chianese has more than 30 years in the field of industrial crystallization. In this respect, he collaborated with the major academic laboratories all over the world and major industrial companies. Between 1998 and 2001 he was the coordinator of the European Thematic Network on Industrial Crystallization (acronym. CRYSOPT) and since 1990 was partner in many European projects. He is one of the two Italian delegates at the European Working Party on Crystallization. Herman J. M. Kramer is associate professor at the Delft University of Technology, The Netherlands, working on the design, monitoring and control of crystallization and precipitation processes. He headed a large number of international multi client, multidisciplinary, research projects on design, monitoring and control of industrial crystallization. He was president of the Dutch Association of Crystal growth and is nowadays member of the European Working Party of Industrial Crystallization.